While the new federal tax law brought good news for most taxpayers, there may be confusion for others trying to determine when certain tax provisions apply. The tax reform items are linked to income thresholds with different definitions of “income.” It is important for clients to understand the impact of the legislation on their 2013 tax bill. For example, clients may want to know at what point there will be a reduced benefit for itemized deductions and personal exemptions and how that level of income is defined. 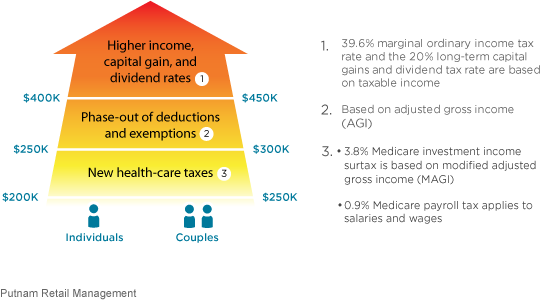 The following graphic is a summary of the key income thresholds. For the new taxes associated with the health-care reform law, the 3.8% Medicare investment income surtax is based on modified adjusted gross income (MAGI), while the extra 0.9% Medicare payroll tax applies to salaries and wages. The phase-out of itemized deductions is based on adjusted gross income (AGI). The new thresholds for the 39.6% marginal ordinary income tax rate and for the 20% long-term capital gains and qualified dividend tax rate are based on taxable income. Clients may benefit from a review of these definitions of income and how the law may affect their particular financial situation.